I told y’all a couple of weeks ago that I’d received this lovely Sparkle Bar of dog shampoo from The Honest Kitchen, in exchange for an honest review. The Honest Kitchen’s Sparkle Bar dog shampoo – y’all, it smells GOOD. Some of y’all know that I have a mild soap obsession, and that I’ve been using Chubbs Bar dog shampoo on my own hair for a couple of years. 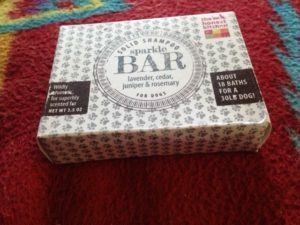 But this last two weeks I’ve been using the Sparkle Bar from The Honest Kitchen. I’m going to break the comparison down as simply as I can, but for use on my hair, not a dog’s. 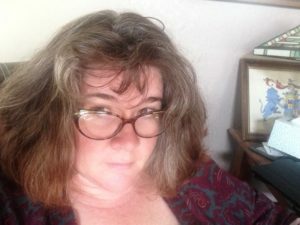 First, I’ll explain my hair, since everyone is unique, and dog shampoo bars are not the best choice for everyone. My hair is at least 25% grey. I just had almost all of the leftover red dye cut out. It’s taken a year to grow it to this length with no color. The grey is wiry and more coarse than the rest. So for two weeks I’ve been using THK’s Sparkle Bar on my hair. The grey is primarily on the sides and more visible when it’s pulled back. I’m concerned about yellowing, which is one reason I’ve been using a bar dog shampoo. What do both bars have in common? 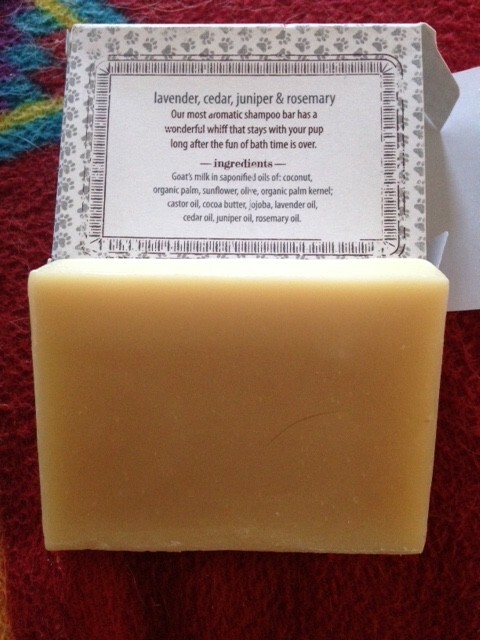 Weight (four ounce bars), shape (rectangular), rinsing clean, made for pet grooming. Sparkle Bar looks like it’s marketed to the individual, or pet owner, while the Chubbs Bar is marketed to groomers, making it less expensive. THK Sparkle Bar dog shampoo. Smells great, feels great, rinses clean, made with real goat’s milk. Which do I love more? That’s really tough to say. They both do a great job on my coarse, thick, wavy, greying hair. They both rinse clean and get my hair squeaky clean. 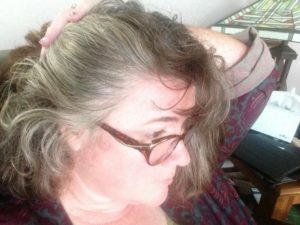 For those of you reading this dog bar shampoo review because you’re thinking about using it on your own grey hair, I love the Chubbs Bar for the brightening and whitening of my grey. I’ll break down the routine I’m currently working on, that seems to work best to moisturize and tame my wiry grey. And for dogs? Y’all, I just love the dog bar shampoo for dogs. Period. It lathers up nicely, targets everywhere with no shampoo waste (I HATE liquid dog shampoo all over the tub or ground! And so much lather!). It rinses clean quickly. The dog is clean and smells good. The Sparkle Bar from THK does have some diatomaceous earth in it, which probably helps kill fleas. I’d honestly suggest getting a bar of each and trying it for yourself, see what you think. Both are excellent value.